I wouldn't put it past the quest design team to put tongue-in-cheek BTTF references all over the start of the expansion. "Flying mounts? Where we're going, we don't need flying mounts." On the other hand... We're heading to an alternate reality where the timeline hasn't progressed as far as our own. We're not quite heading back in time, we're heading to a second timeline that has nothing to do with our own with the exception that all of the events up to the point where Garrosh went back in time were the same. 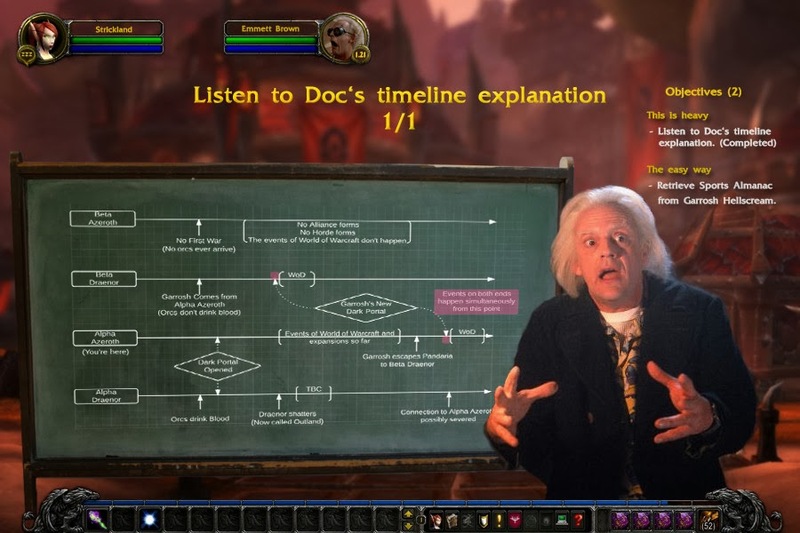 Let's put it this way: In WoW, if you went back in time and killed someone's parents to try and keep them from ever being born, it wouldn't work. Instead, all you would do is create an alternate timeline where that person never existed. If you somehow managed to get back to your original timeline, the person you just tried to kill would alive and well because the events you tried to change already took place in that timeline. It's the same thing here, as soon as Garrosh went back and started changing things, an entirely new, completely separate, timeline/reality was created. And that's where we're headed. Note, that this also opens up a whole can of problems in the game's lore, in that there are likely a wide variety of realities where things do and don't occur, as well a wide variety of realities where Garrosh's influence has a wide range of effects. If the Bronze Dragonflight tries to keep everything down to a single timeline, Garrosh's tampering with things has likely led to very dangerous results on the timeways, and I wonder if part of that will be something we see in the expansion.